The oversewn centre is a great technique for beginners and creates a lovely splash of colour in the centre of your flowers. 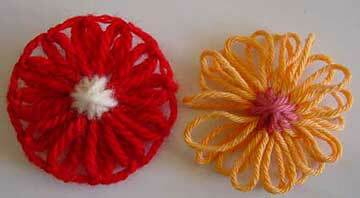 It’s also very fast to work and lets you make a large number of flowers in a small amount of time. 1: Bring your yarn to the opposite side of your loom. Cut it, leaving a 6 inch tail so you can darn it into the back of your flower when you’re finished. 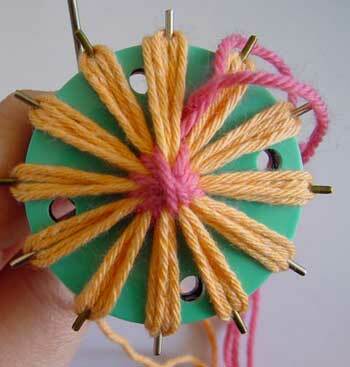 2: Take the colour you want to use for the centre of your flower and thread it between the petals from top to bottom. Leave a tail of this colour as well. 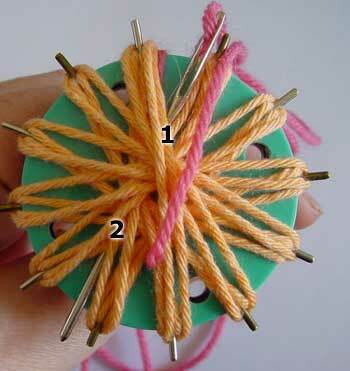 3: Pass your yarn directly across the centre of your flower, pass the needle underneath at the number 1 on the diagram and come out at the next gap on the left of where you started (number 2 on the diagram). 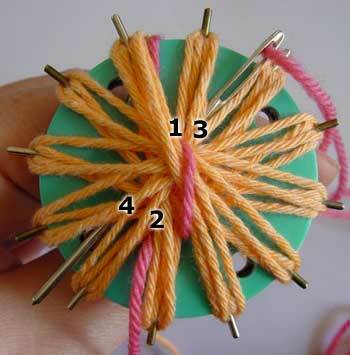 4: Pass the needle under your flower at number 3 and out at number 4. 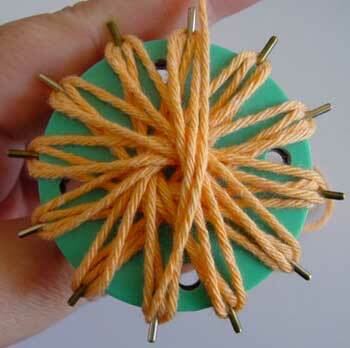 Pull the thread tight each time. Continue stitching around the centre of your flower in this way, stitching in the next empty space between petals each time. Work your way around as many times as you like. 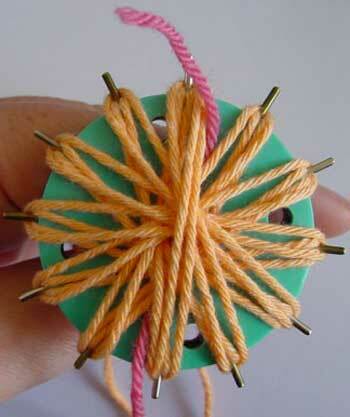 5: When you have finished, cut your yarn, pop your flower off your loom and darn the loose ends into the back. Copyright Sarah Bradberry March 2007. Video copyright August 2011. All rights reserved. No, sorry I don’t sell looms.